John Laidlaw, a member of the fascist British National Party (BNP) who wanted to "kill all black people" has been jailed for a life for a shooting spree in north London. As reported previously on libcom, another BNP member and election candidate is currently on trial for possessing explosives. The BBC reported that Laidlaw, of Holloway, north London, shot at two people in Islington, north London, last May. He missed one of his targets and hit a third person. One of the victims still has a bullet lodged in his neck. The Old Bailey heard that he shot Abu Kamara, 44, in Upper Street before accidentally shooting Emma Sheridan at Finsbury Park Tube station, as he aimed at a second man. 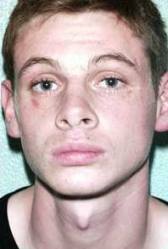 Laidlaw was ordered to serve a minimum of 15 years in prison for the attacks. Passing sentence Judge Samuel Wiggs said Laidlaw "intended to kill" his victims, but they were not racially-motivated attacks. Although both people you aimed at were black I make no finding that your crimes were racially motivated," he said. Following the conviction it emerged Laidlaw was found guilty of a racially-aggravated assault on a driver in 2004 and given a community punishment just days before the London shootings. Social worker Mr Kamara, 44, was with friends after a game of badminton when a sports bag belonging to one of his colleagues brushed against Laidlaw's friend as they passed each other. The gunman reacted by pulling out a gun and shooting Mr Kamara. The bullet deflected off Mr Kamara's chin, went through his voice box before finally lodging near his spinal column. Half an hour after shooting Mr Kamara, Laidlaw shot at Evans Baptiste who was with a friend. Mr Baptiste had chased Laidlaw after recognising him as the man who had attacked him with a hammer earlier in the year. The bullet brushed past Mr Baptiste and struck 26-year-old Emma Sheridan in the back. During the trial the jury saw CCTV footage of Laidlaw at Finsbury Park Tube station brandishing a gun as onlookers cowered in fear. Laidlaw had a history of violence and once vowed he would kill all black people. After he was arrested for a racist attack, he told police he hated all black people and was a member of the British National Party. Just 19 days before his shooting spree in May last year, the 24-year-old admitted to a vicious assault on a black motorist. And he had a string of previous convictions starting at the age of 14. The catalogue of crimes included property damage, public order offences, 16 counts of theft and knife possession. He also carried out seven armed street muggings and had been in and out of jail several times. On 17 October 2004, while already on bail, he was walking in Islington with two other people when unsuspecting motorist Ayandele Pascall beeped his horn to warn them he was behind them. Laidlaw reacted by stamping on the front of the car. When Mr Pascall got out to confront him, he hurled racist abuse at him and punched him in the face. His victim got back into the vehicle, but Laidlaw kicked it once more. Mr Pascall got out again and was punched, kicked and verbally abused. He was left with cuts and bruises. A police report written after Laidlaw was arrested for the attack said he behaved violently in front of officers and was "foaming at the mouth". "In the presence and hearing of the black female gaoler the defendant made racist comments and remarks, stating he was a member of the BNP and that he hated all black people," the document says. "He stated that he was going to kill all black people." Laidlaw, from Holloway, north London, was subsequently convicted of racially aggravated actual bodily harm and using racist language, but the jury in the shootings trial was not told about those offences. He admitted the attack on Mr Pascall and on 5 May last year he was sentenced to an 18-month community supervision order at Snaresbrook Crown Court. Less than three weeks later, he went on the rampage with a gun on Upper Street in Islington and later at Finsbury Park underground station. One of his targets was Evans Baptiste who had chased him after recognising him as the same man who had attacked him with a hammer earlier in the year. Neither police nor prosecutors have tried to ascribe a racist motive to the shootings, but officers said people could form their own view given his previous behaviour. Det Sgt Nick Bonomini, of Scotland Yard's Serious Crime Directorate, said: "He has previously demonstrated a high level of aggression towards black people that appears, given his words, to be based on their race."